We’ve just (i.e. finally) released the code for our SCA 2018 paper on learning sub-grid detail for Navier-Stokes (liquid) simulations with a stochastic deep-learning model. Our approach learns to predict the probability and a Gaussian distribution for under-resolved splash formations. It’s a good example from the larger field of “physics-based deep learning” techniques to enhance physics simulations with the help of neural network techniques. The code comes with a data generator based on our mantaflow framework, and TensorFlow code to train the neural network predictor. The corresponding paper and video can be found here. Full abstract: This paper proposes a new data-driven approach to model detailed splashes for liquid simulations with neural networks. Our model learns to generate small-scale splash detail for the fluid-implicit-particle method using training data acquired from physically parameterized, high resolution simulations. We use neural networks to model the regression of splash formation using a classifier together with a velocity modifier. For the velocity modification, we employ a heteroscedastic model. We evaluate our method for different spatial scales, simulation setups, and solvers. Our simulation results demonstrate that our model significantly improves visual fidelity with a large amount of realistic droplet formation and yields splash detail much more efficiently than finer discretizations. The video for our latent-space physics paper is finally online! It’s been a while, the first paper version was on online on arXiv in February 2018 🙂 The paper will now be presented at Eurographics 2019 in Genoa. Abstract: Our work explores methods for the data-driven inference of temporal evolutions of physical functions with deep learning techniques. More specifically, we target Navier-Stokes / fluid flow problems, and we propose a novel network architecture to predict the changes of the pressure field over time. The central challenge in this context is the high dimensionality of Eulerian space-time data sets. Key for arriving at a feasible algorithm is a technique for dimensionality reduction based on convolutional neural networks, as well as a special architecture for temporal prediction. We demonstrate that dense 3D+time functions of physics system can be predicted with neural networks, and we arrive at a neural-network based simulation algorithm with practical speed-ups. We demonstrate the capabilities of our method with a series of complex liquid simulations, and with a set of single-phase simulations. Our method predicts pressure fields very efficiently. It is more than two orders of magnitudes faster than a regular solver. Additionally, we present and discuss a series of detailed evaluations for the different components of our algorithm. We’re very happy to report that the Thuerey research group has very recently been award a so-called “Proof of Concept” grant by the European Research Council (ERC). We will leverage deep convolutional neural networks (CNNs) with physically-based architectures and loss functions for a first deep learning based flow solver. From the ERC Starting Grant realFlow a first algorithmic realization exists, which provides the core technology that will be taken to the next level within this PoC. Specifically, we plan to employ this technology for a prediction of Reynolds-averaged turbulence flows in order to achieve interactive runtimes for complex simulations that previously took long computing times. However, instead of aiming for general purpose solvers, we will target specific application areas with targeted trained models. This technology has the potential to fundamentally change the way designers and engineers can work with physics simulations to get feedback for their designs. It will also make these simulations available to smaller companies in the value chain that previously were not able to fund and maintain complex simulators. In parallel, our goal is to establish an open platform for exchanging data and trained models for physics simulations. We believe that open standards will on the one hand support the adoption of the new technology, while at the same time providing publicity and marketing opportunities for products to be developed alongside this platform. In particular, the deep learning based turbulence solver will make use of the open data and model formats. In the long run, this will make it possible to incorporate the trained model into new applications, e.g., for solving inverse problems in the context of flow simulations. This animation is more than 10 years old, and one of our first works on fluid control (back then using Lattice-Boltzmann and SPH to simulate the fluid with a free surface). It to does not include any deep-learning or conv-nets – despite this, it’s still fun and worth a look 🙂 Enjoy! Our work on “Generating Liquid Simulations with Deformation-aware Neural Networks” has been conditionally accepted at the International Conference on Learning Representations (ICLR), and will be presented there in May. It focuses on an approach to pre-compute solution spaces for free-surface Navier-Stokes with deformation learning. The first version of our work appeared in April 2017, so video, paper and the accompanying demo Android app can all be already found online. More information here. Liquids exhibit complex non-linear behavior under changing simulation conditions such as user interactions. We propose a method to map this complex behavior over a parameter range onto reduced representation based on space-time deformations. In order to represent the complexity of the full space of inputs, we leverage the power of generative neural networks to learn a reduced representation. We introduce a novel deformation-aware loss function, which enables optimization in the highly non-linear space of multiple deformations. To demonstrate the effectiveness of our approach, we showcase the method with several complex examples in two and four dimensions. Our representation makes it possible to generate implicit surfaces of liquids very efficiently, which makes it possible to display the scene from any angle, and to add secondary effects such as particle systems. We have implemented a mobile application for our full output pipeline to demonstrate that real-time interaction is possible with our approach. Our two papers on learning temporal predictions and reduced representations for fluids have been accepted to the CGF Journal and will be presented at Eurographics 2019 in Milano! Congratulations to Steffen, Moritz, Byungsoo and Vinicius! Our work explores methods for the data-driven inference of temporal evolutions of physical functions with deep learning techniques. More specifically, we target fluid flow problems, and we propose a novel network architecture to predict the changes of the pressure field over time. The central challenge in this context is the high dimensionality of Eulerian space-time data sets. Key for arriving at a feasible algorithm is a technique for dimensionality reduction based on convolutional neural networks, as well as a special architecture for temporal prediction. We demonstrate that dense 3D+time functions of physics system can be predicted with neural networks, and we arrive at a neural-network based simulation algorithm with practical speed-ups. We demonstrate the capabilities of our method with a series of complex liquid simulations, and with a set of single-phase simulations. Our method predicts pressure fields very efficiently. It is more than two orders of magnitudes faster than a regular solver. Additionally, we present and discuss a series of detailed evaluations for the different components of our algorithm. This paper presents a novel generative model to synthesize fluid simulations from a set of reduced parameters. A convolutional neural network is trained on a collection of discrete, parameterizable fluid simulation velocity fields. 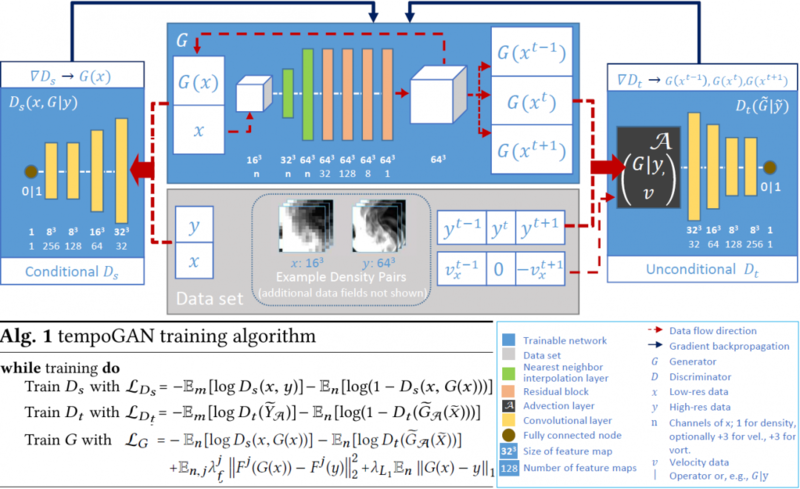 Due to the capability of deep learning architectures to learn representative features of the data, our generative model is able to accurately approximate the training data set, while providing plausible interpolated in-betweens. The proposed generative model is optimized for fluids by a novel loss function that guarantees divergence-free velocity fields at all times. In addition, we demonstrate that we can handle complex parameterizations in reduced spaces, and advance simulations in time by integrating in the latent space with a second network. Our method models a wide variety of fluid behaviors, thus enabling applications such as fast construction of simulations, interpolation of fluids with different parameters, time re-sampling, latent space simulations, and compression of fluid simulation data. Reconstructed velocity fields are generated up to 700x faster than traditional CPU solvers, while achieving compression rates of over 1300x. Abstract: In computer graphics, many traditional problems are now better handled by deep-learning based data-driven methods. In an increasing variety of problem settings, deep networks are state-of-the-art, beating dedicated hand-crafted methods by significant margins. This tutorial gives an organized overview of core theory, practice, and graphics-related applications of deep learning. Our work on video super-resolution with GANs is online now as a preview. The main trick is a special discriminator CNN that learns to supervise in terms of detail as well as temporal coherence. In addition, we propose a novel set of metrics for quantifying temporal coherence in videos. Enjoy 🙂 ! Abstract: Adversarial training has been highly successful in the context of image super-resolution. It was demonstrated to yield realistic and highly detailed results. Despite this success, many state-of-the-art methods for video super-resolution still favor simpler norms such as L_2 over adversarial loss functions. This is caused by the fact that the averaging nature of direct vector norms as loss functions leads to temporal smoothness. The lack of spatial detail means temporal coherence is easily established. In our work, we instead propose an adversarial training for video super-resolution that leads to temporally coherent solutions without sacrificing spatial detail. In our generator, we use a recurrent, residual framework that naturally encourages temporal consistency. For adversarial training, we propose a novel spatio-temporal discriminator in combination with motion compensation to guarantee photo-realistic and temporally coherent details in the results. We additionally identify a class of temporal artifacts in these recurrent networks, and propose a novel Ping-Pong loss to remove them. Quantifying the temporal coherence for image super-resolution tasks has also not been addressed previously. We propose a first set of metrics to evaluate the accuracy as well as the perceptual quality of the temporal evolution, and we demonstrate that our method outperforms previous work by yielding realistic and detailed images with natural temporal changes. We will be presenting our recent works on physics-based deep learning for fluid flow at the NIPS 2018 workshop on “Modeling the Physical World: Learning, Perception, and Control“, organized by Jiajun Wu, Kelsey Allen, Kevin Smith, Jessica Hamrick, Emmanuel Dupoux, Marc Toussaint, and Joshua Tenenbaum. Latent-space Physics: Towards Learning the Temporal Evolution of Fluid Flow: Our work explores methods for the data-driven inference of temporal evolutions of physical functions with deep learning techniques. More specifically, we target fluid flow problems, and we propose a novel network architecture to predict the changes of the pressure field over time. The central challenge in this context is the high dimensionality of Eulerian space-time data sets. Key for arriving at a feasible algorithm is a technique for dimensionality reduction based on convolutional neural networks, as well as a special architecture for temporal prediction. We demonstrate that dense 3D+time functions of physics system can be predicted with neural networks, and we arrive at a neural-network based simulation algorithm with practical speed-ups. We demonstrate the capabilities of our method with a series of complex liquid simulations, and with a set of single-phase simulations. Our method predicts pressure fields very efficiently. It is more than two orders of magnitudes faster than a regular solver. Additionally, we present and discuss a series of detailed evaluations for the different components of our algorithm. Temporally Coherent, Volumetric GAN for Super-resolution Fluid Flow: We propose a temporally coherent generative model addressing the super-resolution problem for fluid flows. Our work represents the first approach to synthesize four-dimensional physics fields with neural networks. Based on a conditional generative adversarial network that is designed for the inference of three-dimensional volumetric data, our model generates consistent and detailed results by using a novel temporal discriminator, in addition to the commonly used spatial one. Our experiments show that the generator is able to infer more realistic high-resolution details by using additional physical quantities, such as low-resolution velocities or vorticities. Besides improvements in the training process and in the generated outputs, these inputs offer means for artistic control as well. We additionally employ a physics-aware data augmentation step, which is crucial to avoid overfitting and to reduce memory requirements. In this way, our network learns to generate advected quantities with highly detailed, realistic, and temporally coherent features. Our method works instantaneously, using only a single time-step of low-resolution fluid data. We demonstrate the abilities of our method using a variety of complex inputs and applications in two and three dimensions. Coupled Fluid Density and Motion from Single Views: We present a novel method to reconstruct a fluid’s 3D density and motion based on just a single sequence of images. This is rendered possible by using powerful physical priors for this strongly under-determined problem. More specifically, we propose a novel strategy to infer density updates strongly coupled to previous and current estimates of the flow motion. Additionally, we employ an accurate discretization and depth-based regularizers to compute stable solutions. Using only one view for the reconstruction reduces the complexity of the capturing setup drastically and could even allow for online video databases or smart-phone videos as inputs. The reconstructed 3D velocity can then be flexibly utilized, e.g., for re-simulation, domain modification or guiding purposes. We will demonstrate the capacity of our method with a series of synthetic test cases and the reconstruction of real smoke plumes captured with a Raspberry Pi camera. Our course on “Deep Learning in Computer Graphics” was accepted at @SIGGRAPHAsia 2018, and is scheduled now for Dec. 4, together with our colleagues from UCL: Niloy Mitra and Paul Guerrero. Deep Flow Prediction is a pytorch framework for fluid flow (Reynolds-averaged Navier Stokes) predictions with deep learning. It contains code for data generation, network training, and evaluation for the aforementioned paper. A brief manual for the ode can be found in the github repository. Abstract: With this study we investigate the accuracy of deep learning models for the inference of Reynolds-Averaged Navier-Stokes solutions. We focus on a modernized U-net architecture, and evaluate a large number of trained neural networks with respect to their accuracy for the calculation of pressure and velocity distributions. In particular, we illustrate how training data size and the number of weights influence the accuracy of the solutions. With our best models we arrive at a mean relative pressure and velocity error of less than 3% across a range of previously unseen airfoil shapes. In addition all source code is publicly available in order to ensure reproducibility and to provide a starting point for researchers interested in deep learning methods for physics problems. While this work focuses on RANS solutions, the neural network architecture and learning setup are very generic, and applicable to a wide range of PDE boundary value problems on Cartesian grids. We’are currently (as of Oct. 13) demoing our deformation neural network app and real-time fluid solver at the TUM open house 2018. You can of course also check out our “Neural Liquid Drop” App on the Android app store. You Xie and Rachel Chu just successfully presented their paper “tempoGAN: A Temporally Coherent, Volumetric GAN for Super-resolution Fluid Flow” at SIGRGAPH 2018. You can enjoy their full presentation via the YouTube video below. We propose a temporally coherent generative model addressing the super-resolution problem for fluid flows. Our work represents the first approach to synthesize four-dimensional physics fields with neural networks. Based on a conditional generative adversarial network that is designed for the inference of three-dimensional volumetric data, our model generates consistent and detailed results by using a novel temporal discriminator, in addition to the commonly used spatial one. Our experiments show that the generator is able to infer more realistic high-resolution details by using additional physical quantities, such as low-resolution velocities or vorticities. Besides improvements in the training process and in the generated outputs, these inputs offer means for artistic control as well. We additionally employ a physics-aware data augmentation step, which is crucial to avoid overfitting and to reduce memory requirements. In this way, our network learns to generate advected quantities with highly detailed, realistic, and temporally coherent features. Our method works instantaneously, using only a single time-step of low-resolution fluid data. We demonstrate the abilities of our method using a variety of complex inputs and applications in two and three dimensions. It comes with a readme, data generation scripts, and should give an easy starting point for training generative adversarial nets for fluids. If you try it, let us know how it works! Here’s again the full abstract of the paper: We propose a temporally coherent generative model addressing the super-resolution problem for fluid flows. Our work represents the first approach to synthesize four-dimensional physics fields with neural networks. Based on a conditional generative adversarial network that is designed for the inference of three-dimensional volumetric data, our model generates consistent and detailed results by using a novel temporal discriminator, in addition to the commonly used spatial one. Our experiments show that the generator is able to infer more realistic high-resolution details by using additional physical quantities, such as low-resolution velocities or vorticities. Besides improvements in the training process and in the generated outputs, these inputs offer means for artistic control as well. We additionally employ a physics-aware data augmentation step, which is crucial to avoid overfitting and to reduce memory requirements. In this way, our network learns to generate advected quantities with highly detailed, realistic, and temporally coherent features. Our method works instantaneously, using only a single time-step of low-resolution fluid data. We demonstrate the abilities of our method using a variety of complex inputs and applications in two and three dimensions. Congratulations to Marie-Lena Eckert for winning the best-paper award at SCA 2018 for her submission “Coupled Fluid Density and Motion from Single Views”. Her work aims for reconstructing fluid flow phenomena with strong Navier-Stokes priors. This makes it possible to compute dense flow fields based on only a monocular video, i.e., an image sequence from a single viewpoint. Paper Abstract: We present a novel method to reconstruct a fluid’s 3D density and motion based on just a single sequence of images. This is rendered possible by using powerful physical priors for this strongly under-determined problem. More specifically, we propose a novel strategy to infer density updates strongly coupled to previous and current estimates of the flow motion. Additionally, we employ an accurate discretization and depth-based regularizers to compute stable solutions. Using only one view for the reconstruction reduces the complexity of the capturing setup drastically and could even allow for online video databases or smart-phone videos as inputs. The reconstructed 3D velocity can then be flexibly utilized, e.g., for re-simulation, domain modification or guiding purposes. It contains both the Navier-Stokes solver for data generation (based on mantaflow http://mantaflow.com), and the keras code (for tensorflow https://www.tensorflow.org) for training the autoencoder and LSTM networks. The final version of our paper on learning droplet formation models with neural networks is online now. It will be presented at SCA 2018 in Paris. Our paper proposes a new data-driven approach to model detailed splashes for liquid simulations with neural networks. Our model learns to generate small-scale splash detail for the fluid-implicit-particle method using training data acquired from physically parameterized, high resolution simulations. We use neural networks to model the regression of splash formation using a classifier together with a velocity modifier. For the velocity modification, we employ a heteroscedastic model. We evaluate our method for different spatial scales, simulation setups, and Navier-Stokes solvers. Our simulation results demonstrate that our model significantly improves visual fidelity with a large amount of realistic droplet formation and yields splash detail much more efficiently than finer discretizations. Our SCA 2018 paper on Coupled Fluid Density and Motion from Single Views is online now! You can check it out here. We’re reconstructing a dense fluid flow field from a single video stream using a strong Navier-Stokes prior. We present a novel method to reconstruct a fluid’s 3D density and motion based on just a single sequence of images. This is rendered possible by using powerful physical priors for this strongly under-determined problem. More specifically, we propose a novel strategy to infer density updates strongly coupled to previous and current estimates of the flow motion. Additionally, we employ an accurate discretization and depth-based regularizers to compute stable solutions. Using only one view for the reconstruction reduces the complexity of the capturing setup drastically and could even allow for online video databases or smart-phone videos as inputs. The reconstructed 3D velocity can then be flexibly utilized, e.g., for re-simulation, domain modification or guiding purposes. We will demonstrate the capacity of our method with a series of synthetic test cases and the reconstruction of real smoke plumes captured with a Raspberry Pi camera. New openings for positions to be posted here soon. Physics-based deep learning — plus some classical numerics, of course.